Barclays is the first bank to settle with regulators as part of an interest-rate manipulation investigation. 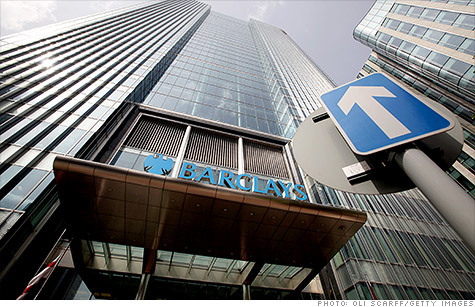 NEW YORK (CNNMoney) -- Heads have rolled at British bank Barclays. But it was not alone in manipulating worldwide interest rates. Barclays (BCS) chairman Marcus Agius resigned Monday and CEO Bob Diamond followed suit Tuesday. Later Tuesday, Chief Operating Officer Jerry del Missier resigned effective immediately. They may be just the first of many executives felled by a broader probe into interest rate manipulation by big banks. Seven additional banks are cited but not named in documents made public as part of Barclays' settlement last week with the Financial Services Authority, the British banking regulator. Barclays was fined roughly $453 million by the FSA, Commodity Futures Trading Commission and the U.S. Department of Justice. The pushback from Barclays' shareholders and regulators in the U.S. and the United Kingdom has been swift. But the investigation of the manipulation of global interest rates has been going on for four years -- and it is not over yet. "This dwarfs by orders of magnitude any financial scams in the history of markets, said Andrew Lo, a professor of finance at the Massachusetts Institute of Technology. Deutsche Bank (DB), Royal Bank of Scotland (RBS), Credit Suisse (CS), Citigroup (C, Fortune 500), JPMorgan Chase (JPM, Fortune 500) and UBS (UBS) are among the banks that have acknowledged that they are being investigated by regulators. Bank of America (BAC, Fortune 500) is also reportedly being investigated. But the bank has not made any public statements about the scandal, and a spokesperson declined to comment. "There's nothing in the documents that show that this is unique to Barclays," said Arun Subramanian, a partner with the law firm Susman Godfrey, the lead counsel to a class of plaintiffs suing Barclays and other banks for damages resulting from the changes in interest rates. The FSA said it gave Barclays a 30% discount on its fines for settling quickly. "The question is whether Barclays' announcement came first because they were the ringleaders or the most cooperative," said Owen Watkins, a former regulator at the FSA and a partner at the London law firm Lewis Silkin. Floating interest rates are set through a peculiar process that largely relies on word of mouth from traders at up to 18 representative banks. The key floating rate is the London Interbank Offered Rate, or Libor, and it serves as a global benchmark for home mortgages, student loans and what cities and states pay to borrow money. It affects up to $800 trillion worth of financial instruments. Barclays and other banks altered those costs when reporting them to regulators, according to documents field with the FSA. They worked in conjunction with other banks to move these rates in directions that helped the banks benefit from trading positions, according to FSA documents. According to the damning emails and text messages filed as part of Barclays' settlement with the FSA, one email from a Barclays' employee sent in October 2006 asked "an external trader" to set the three month LIBOR rate lower. When it moved lower the next day, a trader from another bank wrote to a Barclay's trader: "Dude. I owe you big time! Come over one day after work and I'm opening a bottle of Bollinger." While the regulatory investigations are ongoing, several plaintiffs are waiting for a judge in the Southern District of New York to rule on whether a case for potential damages arising from LIBOR manipulation can move forward. The city of Baltimore is the lead plaintiff in this case. Meanwhile, Diamond won't be celebrating like other Americans on Independence Day. On Wednesday, he'll be answering questions from British lawmakers about the scandal.